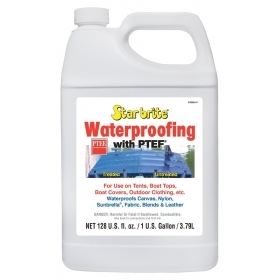 Starbrite Waterproofing & Fabric Treatment. Top - rated waterproofing. 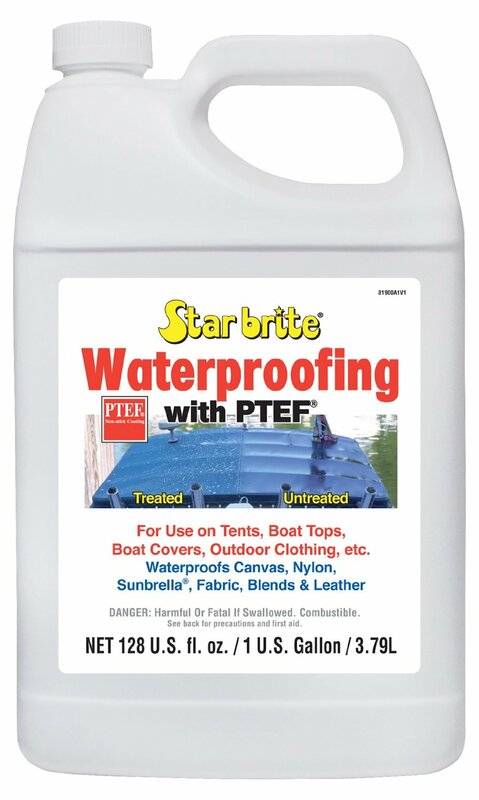 Boat covers, bimini tops, sail covers, clothing, tents Starbrite's PTEF-based formula provides the protection you're looking for without changing the look or feel of the fabric. Safe for all fabrics including Sunbrella. WARNING: This item cannot be shipped to Canada. Sheds water like duck feathers. Amazing. Expensive but worth it. I was impressed on how fast this was shipped and received by me. Was not expecting it so quick. Hope it works. Price was least expensive after doing a web search (that's why you're here reading this, right?) It shipped within a day and arrived on time. No issues. So I will use Boaters Plus again. As for the product. It went on my canvas easy enough. I used a gallon hand pressure sprayer to apply it. It can get messy with over spray and pooling. I'm glad I didn't spray it while the canvas was on the boat... as was my original intention. Sorry but can't comment on if it works as waterproof because I haven't installed canvas back on boat yet. It did dry well and looks fine. Smells a little but that should clear up after canvas is back on the boat. Great product! Does not change the appearance or feel of material once treated and dried, and that includes all kinds of fabrics and even leather! It does smell quite strong, so outdoor application is a must. Becareful not to get the stuff on the floor during application... It made my bamboo mat as shiny and slippery as the surface of a Teflon pan! And it water proofed the mat! Great product and will re-apply my jackets, bags, and shoes, every year! "Great prices , great communication, right parts and fast ship will buy again thanks"
"Excellent prices & very quick shipping, excellent quality merchandise." "I was looking for a special safety produce for my boat and not only did Boatersplus have it it..."
"Never got a tracking number and the order was wrong. I ordered two different items but only got..."